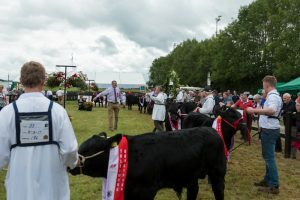 The most prestigious and valuable classes at the Show again this year were the two All Ireland Irish Angus Bull Calf Championships. With 22 calves qualified for each final, the championship is a credit to everyone involved – exhibitors, judges, stewards and sponsors. The exhibitors qualified from shows all over the country. The sponsors are due a special mention for without their very generous support these classes would not be recognized as one of the best in Europe never mind the best in Ireland. There are two finals. One for bull calve born between 1st of August 2016 and 30th November 2016 and the other for bull calves born between the 1st December 2016 and 30th April 2017. Congratulation go to the winners. The younger class was won by Pat Murray from Roscrea and the older one by John Appleby from Clonakilty. The full results can be found on the results page of this website.